“BookMyLot is the #1 resource for hiring food trucks for your office park, workplace, special event or promotion in most major markets across the country. Since the beginning of the gourmet food truck boom, Book My Lot has been at the forefront of the scene, focused on providing mobile vending solutions for clients all over the country. 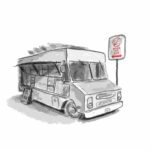 ​Because of our close affiliation with the National Food Truck Association, our extensive ​roster of ​gourmet food trucks is what sets us apart and it’s constantly ​updating with new and exciting cuisines. Our reputation rests with the ​vendors we place​ and the friendly staff we appoint to our clients, so if you’re not ​satisfied with our service or left hungry, we’re not happy. Are you a property manager of a business park or large office building that doesn’t provide an on-site café for your tenants or the local restaurants are just too far away? Is that concessions contract with your in-house restaurant just not as profitable as you’d imagined, hoping it expires sooner rather than later so there are no more out of pocket costs? Are you a production coordinator for a large film studio that wishes they had a one point of contact for all of their food vendor needs? Heading a school fundraiser or looking to bring a fun and social amenity to your Church after Sunday mass? Or are you just a regular Joe that coordinates festivals and dreads the day you have to call 50 different food vendors to schedule your event? Have An Experience With Book My Lot? Fairness - Do the sales you earn via this organizer justify the fees they charge? Is their cancelation policy reasonable? Lots - Are customers provided the schedule in a timely manner? Are the serving times and parking locations clear? Was there an onsite representative? Organization - Is the booking process easy? Is the calendar readily available to patrons? Are menus provided beforehand? Responsiveness - Does the organizer respond to requests in a timely manner? Process refunds and cancellations in a timely and transparent manner? Are they courtesy and helpful? Book My Lot cares about the trucks and is always helpful when we inquire about their lots. Their fees are fair and they will work with you if you let them know that a spot is not doing as well. One of the best bookers in L.A.